As a new outbreak of Ebola haemorrhagic fever strikes northwestern Congo, ESA is set to gather satellite data to help resolve the scientific enigma of this deadly disease. Whenever Ebola strikes Central Africa it can kill in large numbers. More than two dozen people have so far died during the latest epidemic, centred on the town of Mbomo in the Cuvette West region of Congo, near the Gabon border. The disease causes runaway internal bleeding in humans and also apes. The Ebola virus undoubtedly has its home in deep tropical jungle, but its natural host organism or 'reservoir' remains unknown. "Humans get infected only when an individual gets into contact with an already-infected animal," said Ghislain Moussavou of the Gabon-based International Centre for Medical Research (CIRMF). "In Gabon and Congo there were no human outbreaks between 1998 and 2000, but we canâ€™t affirm no outbreak occurred among some fauna. Mostly it is the animal population that is damaged â€“ particularly gorillas and chimpanzees." The origin of the current Congo outbreak has been traced back to the end of October, when hunters from Mbomo ate a wild boar they found dead in the jungle. The very fact infected animals sicken and die shows they are not the elusive Ebola reservoir. CIRMF â€“ equipped with a rare Level 4 Biosafety Laboratory engineered for the study of dangerous pathogens â€“ is on the hunt for whatever organism actually serves as the long-term virus host by testing the blood of captured jungle animals. The sheer biological diversity and geographical inaccessibility of the Central African rainforest makes that a difficult task. However from next year ESA will be supplying Earth Observation (EO) data of the region to CIRMF as one component of a new DUE project called Epidemio. 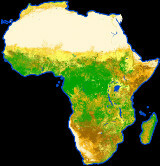 Moussavou hopes that this data - once imported into geographical information system (GIS) software - may provide some additional clues: "Characterising the ecological parameters of the whole area of study just canâ€™t be done just by ground-based means. But remote sensing and GIS can do it at low cost, and with regular updating a possibility. "The CIRMF team carrying out the serological study on animal populations concentrates its efforts on the gorilla sanctuary of Lossi in Congo, where a high mortality of gorillas has been documented during previous epidemics. But Lossi is located in deep forest, more than 15km from the nearest vehicle track. The sanctuary itself measures 400 sq km, and a total sampling is practically impossible in time and space. "Assuming there are many deep forest locations infected by the virus, and with the goal in mind of diversifying the areas sampled to improve the results of the serological study, a preliminary identification and description of these sites is necessary. Remote sensing can help identify such sites and focus the efforts there." By mapping the areas where infected animals are found within a GIS, areas with similar environmental features can be highlighted as suspected sites for priority study. And in future CIRMF plans to begin a study of Ebola antibody prevalence in the human population, helping to identify potential infection risk zones. "With a GIS we can manage, organise and display data from a variety of different sources," Moussavou added. "Assuming this, our approach includes spatial and temporal study of the dynamics of vegetation state, fluctuations in water body levels and climate changes â€“ all of which we can obtain from satellites." Detailed meteorological data â€“ currently almost non-existent â€“ could be important because the periodicity of Ebola outbreaks points to a seasonal component: "This suggests particular ecological conditions could characterise the reservoir host habitat," Moussavou concluded. 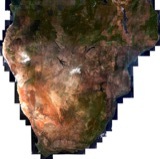 Part of ESA's Data User Element and commencing in January 2004, the Epidemio project is intended to develop Earth Observation services for epidemiologists, with a particular concentration on Africa.